I generated a raw printout of all the posts that were published in this blog so far in PDF. It’s a big 383MB file with 584 pages, but the posts are in chronological order, which makes them easier to read. I also generated bookmarks. You can simply click the image below which is a link to the file. The pages were simply printed in PDF using Firefox and has a minor bug (a “follow” link which sometimes overlaps images and text). I also tried in Chrome, Safari and Opera, but their bugs produced empty pages or weird image scaling. Links and videos obviously don’t work, but it should be easier to browse, search and read sequences of posts. I made this one very fast. First because I didn’t have to do much speculative research. 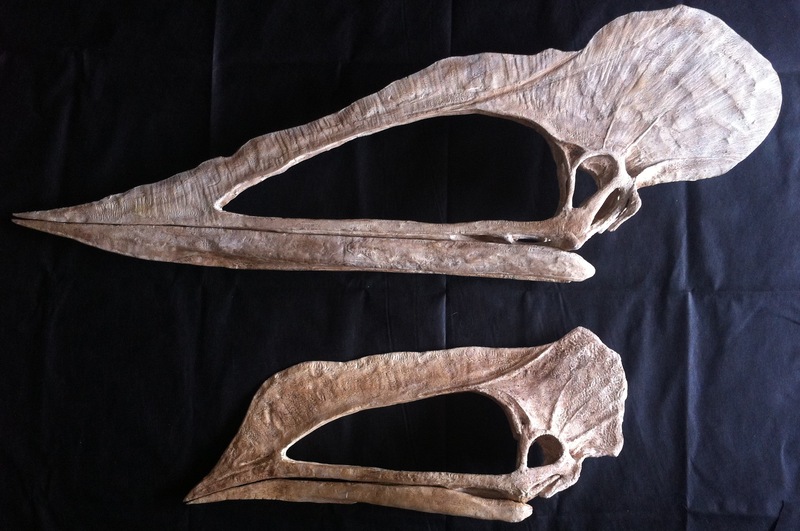 I used the source photos, and based the unknown parts on Thalassodromeus and Tupuxuara. Second, because I’m getting better at this. It still takes three days because I have to wait for the glue to dry before continuing. So I might work for 20 minutes, and wait an hour or two before working again for another 20 minutes. When I work in different parts of the skeleton I can be more productive. 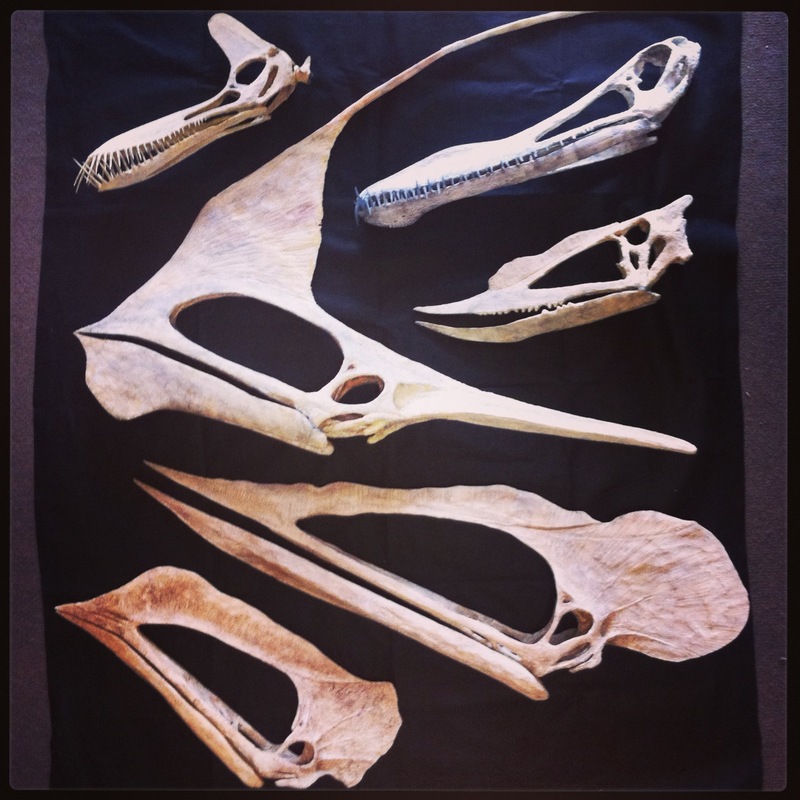 In this case, I worked simultaneously on the skull and on the mandible and was able to speed things up a bit. 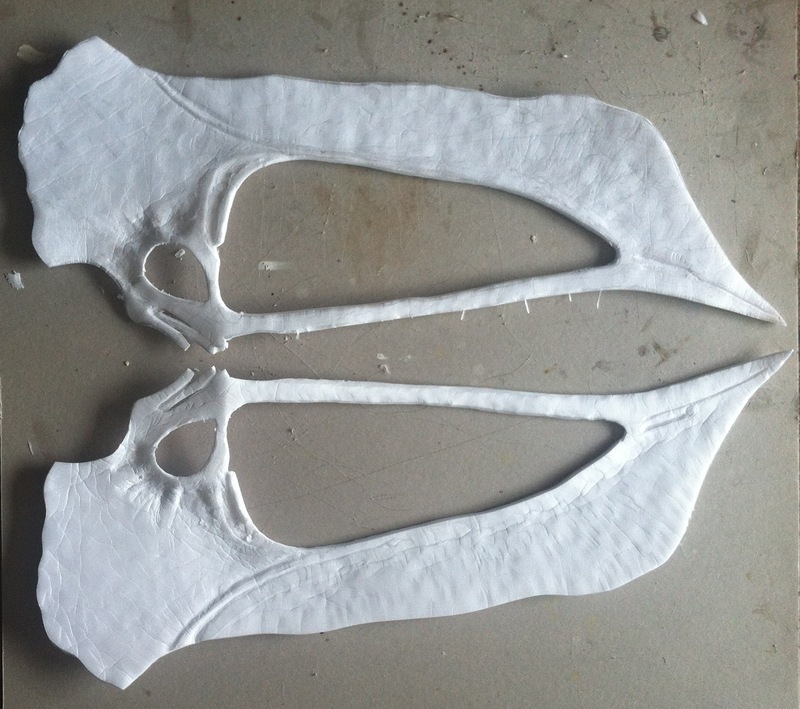 It took me three hours to make the first foam “3D sketch” of the skull. And then another three hours for the mandible and palate. Then I spent eight hours adding the little details (which make all the difference). And finally two more hours to finish it with resin and coffee. 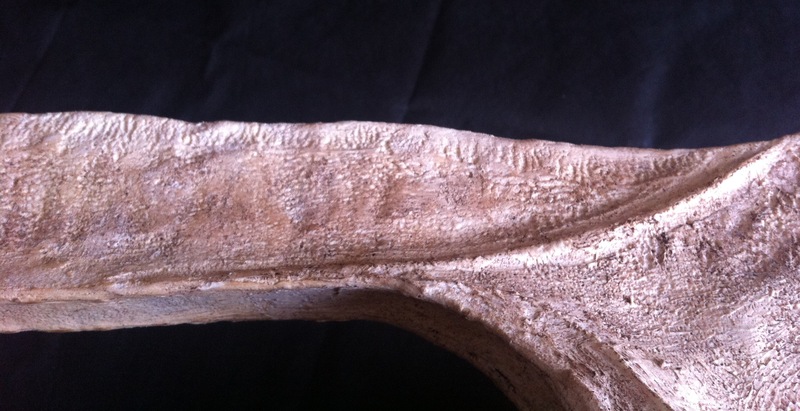 The only dimensions I obtained from the fossil photograph were height and length (based on the length informed by the seller, since the photos had no scale information). The width was estimated using Thalassodromeus and Tupuxuara as referenes. 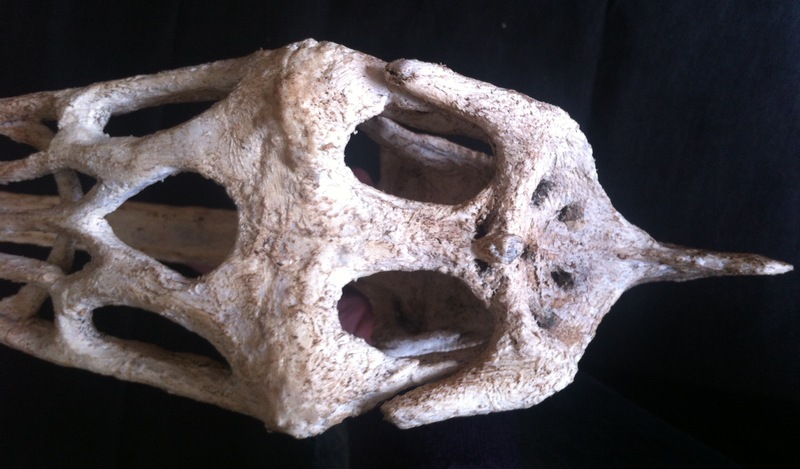 The skull should get lighter during the next couple of weeks, when the resins and glues dry completely (when I first weighed Tupuxuara’s skull it weighed 290 grams; One month later it weighed 220 grams). 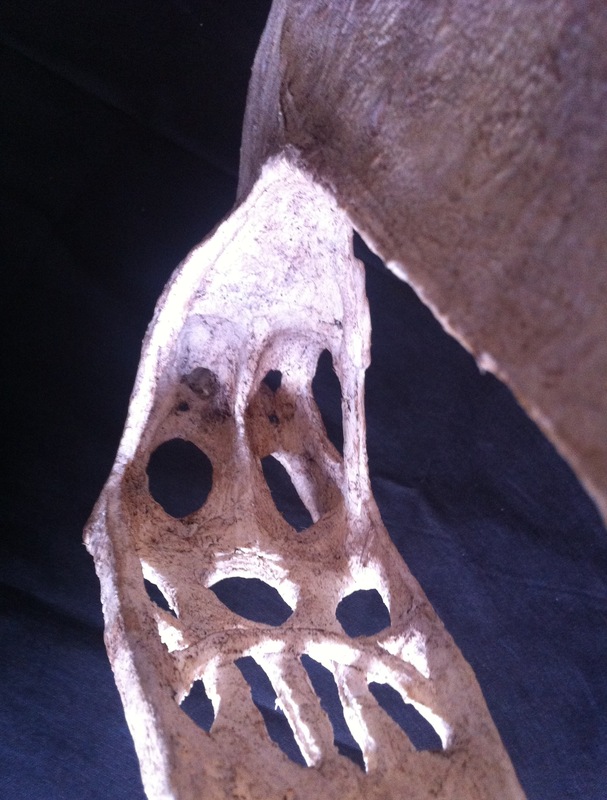 Here are photos of the finished skull. 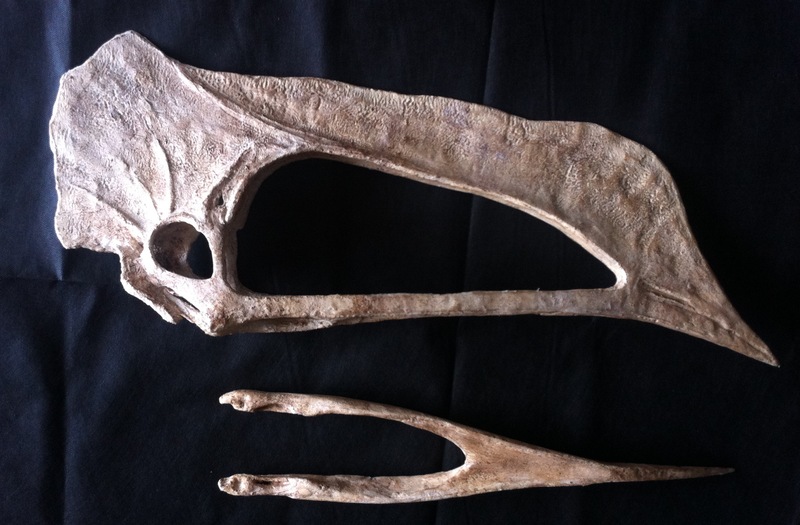 This is pterosaur #6 compared with pterosaur #5 (Tupuxuara leonardii). And here is the whole Imaginary Pterosaur family so far: Guidraco (#1), Tupandactylus (#3), Anhanguera (#2), Dsungaripterus (#4), Tupuxuara (#5) and pterosaur #6. 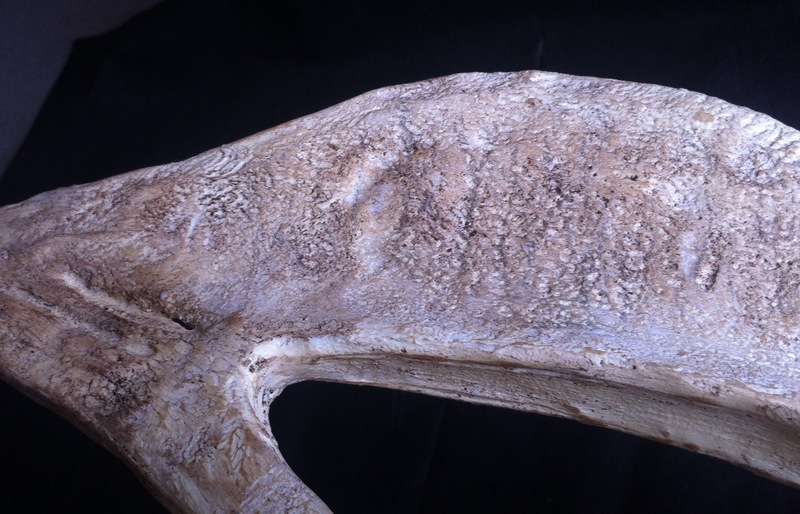 Here is a list of all the posts related to the construction of this skull. Many of the techniques I used here I have detailed before in posts about the other skulls. 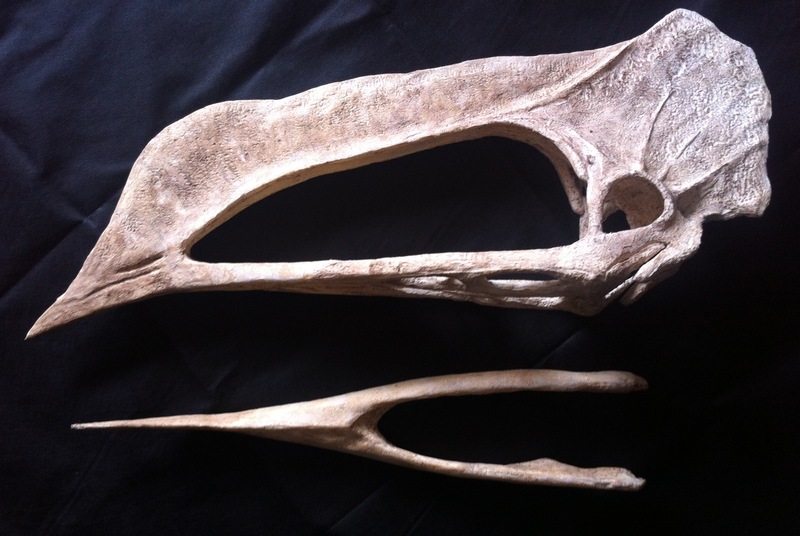 Imaginary pterosaur #6: an unknown thalassodromid/tapejarid (this post). The only fossil source I used to make this model were four photos that were recently available at the Paleo Direct site (one of them I posted here). They aren’t there anymore. 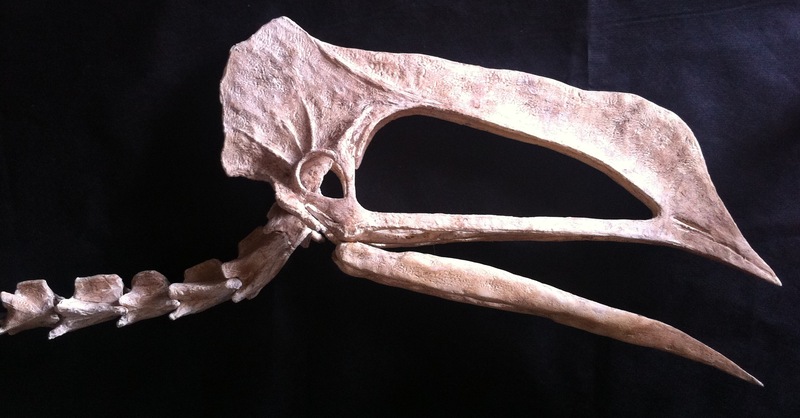 Besides that I had help from the paleontologist Hebert Bruno Campos, from whom I obtained information on the palate, mandible and skull details of the Thalassodromeus, used to fill the gaps. 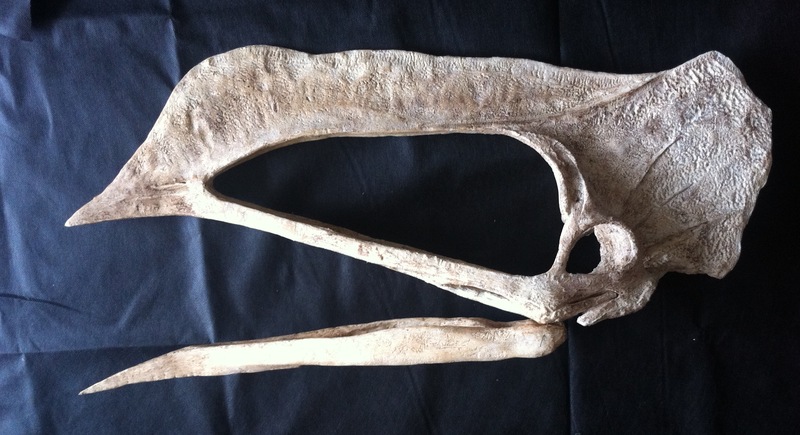 In a few days I will travel with my pterosaurs to the 3rd International Symposium on Pterosaurs: Rio Ptero 2013. I decided to take some time and add one more skull to the family. This fossil was on sale at Paleodirect but not anymore. Either it was sold or (hopefully) acquired by a paleontological institution. 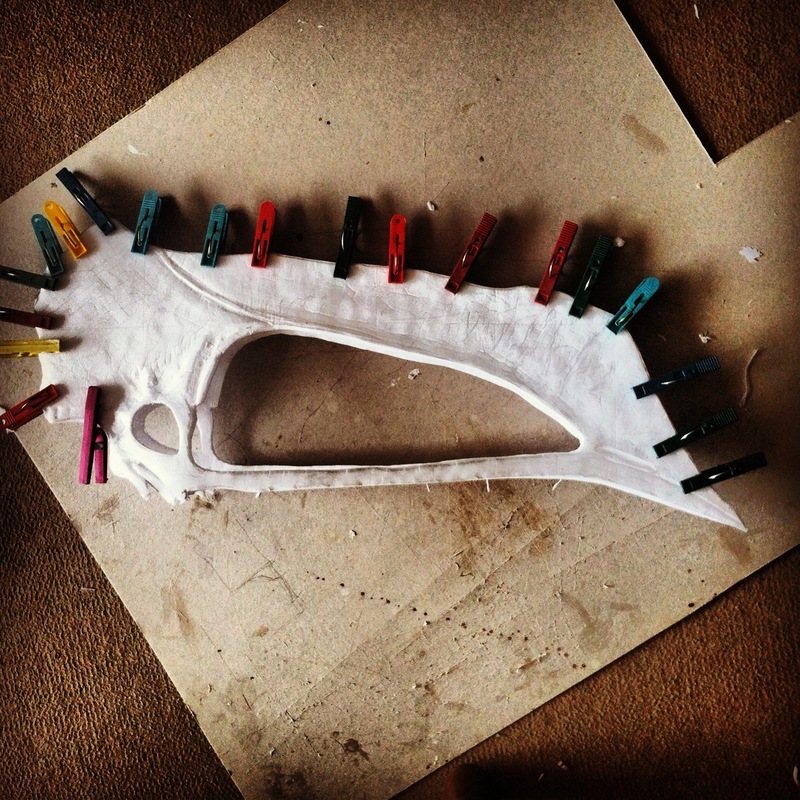 I am making the skull out of foam using only the few photos that were available online (unfortunately the link is now broken). This is the main photo. 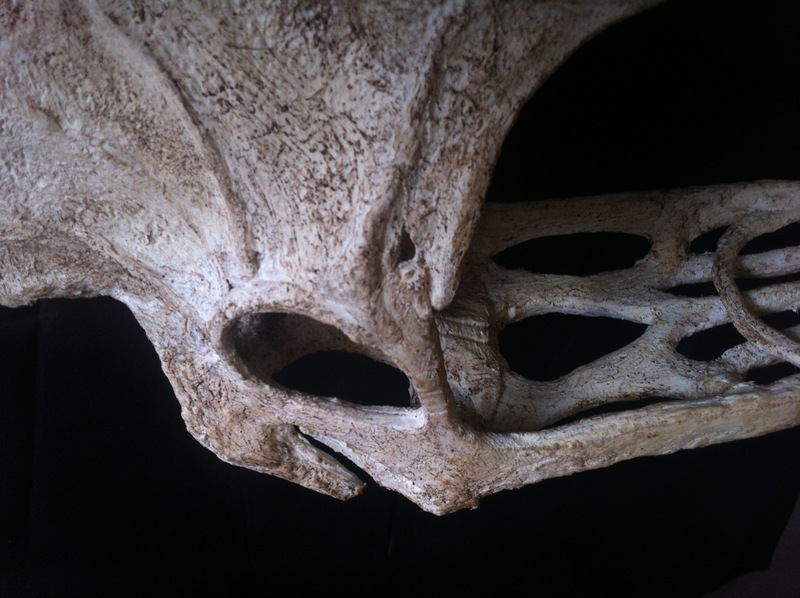 It consists of a full skull and mandible, and the first cervical vertebra and is about 60cm long. Compare it to the Tupuxuara (a Thalassodromid). 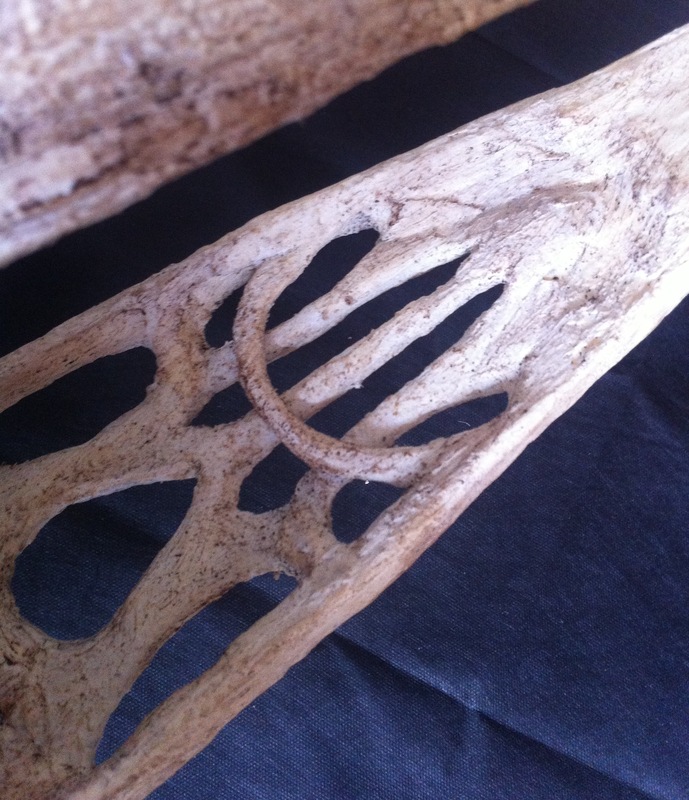 If you look at the position of the orbit, the two crests, the mandible, you might say it’s a Thalassodromid. But if you look at the beak and the size of the head it might remind you of a tapejarid, such as Ingridia navigans, for example. It’s somewhere in between these two genera and it’s evidence that Thalassodromids and Tapejarids may be somehow related. 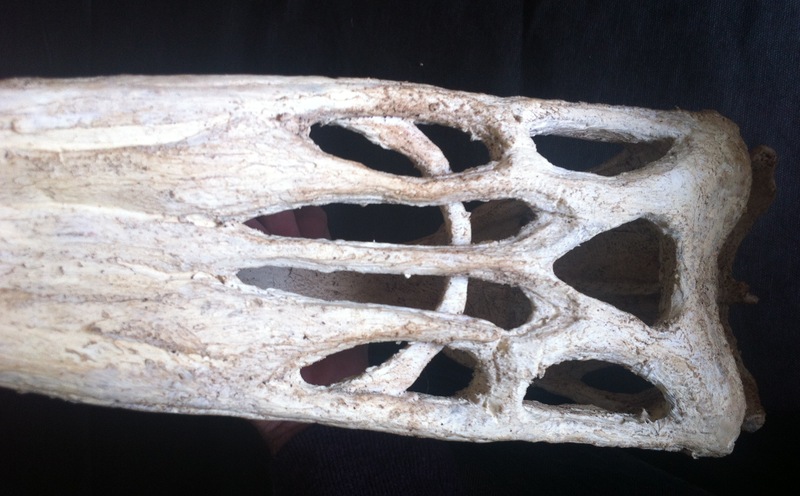 Since the rear part of the skull is very similar to the Tupuxuara, I will use the Tupuxuara as a model for the palate and the bones behind and inside the head. 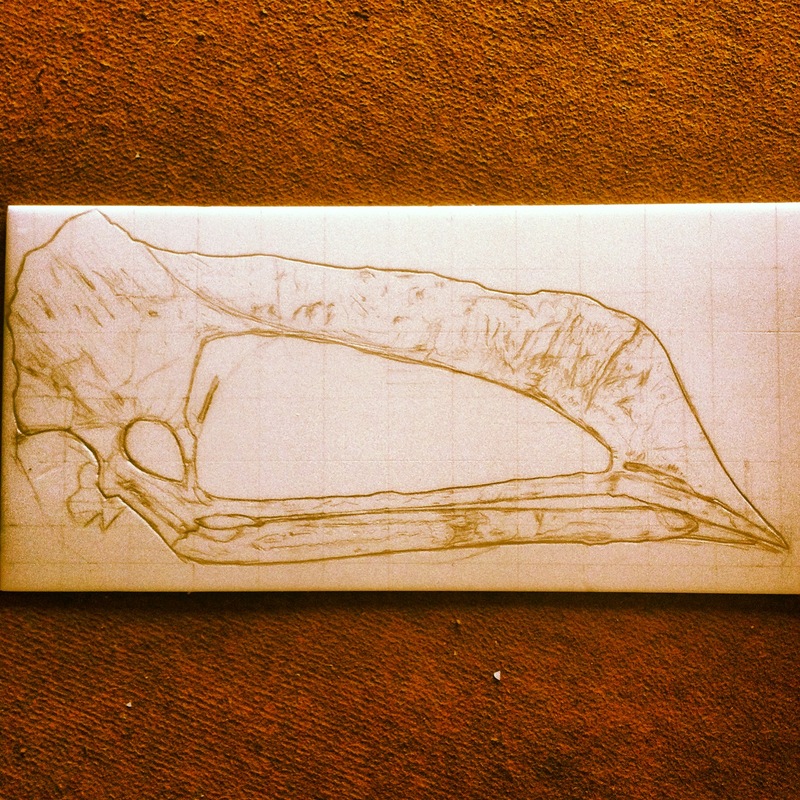 I started out as usual, transferring the outlines of the fossil to a sheet of foam, scaled to the fossil’s dimensions. Since the heads of these pterosaurs are almost flat, I don’t have to compensate much of what I lose due to the 2D projection (I just compensate a bit around the orbits and below the mandible). Lost details I can always add later, with extra bits of foam. This is the final sketch. 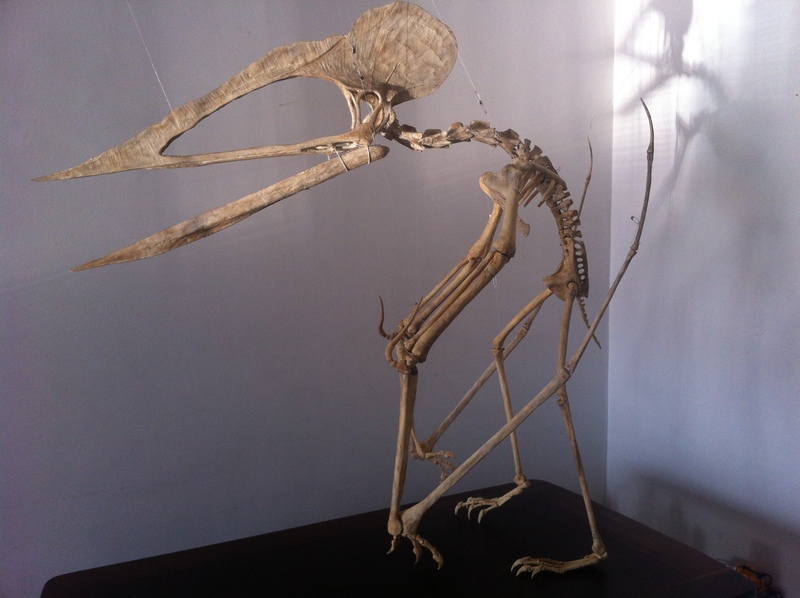 You can now finally see what it looks with the beak open. After cutting out the two halves I spent some time pressing, folding, and shaping the foam to make it three-dimensional, and cutting out some details. I don’t really know what that cavity near the beak tip is. 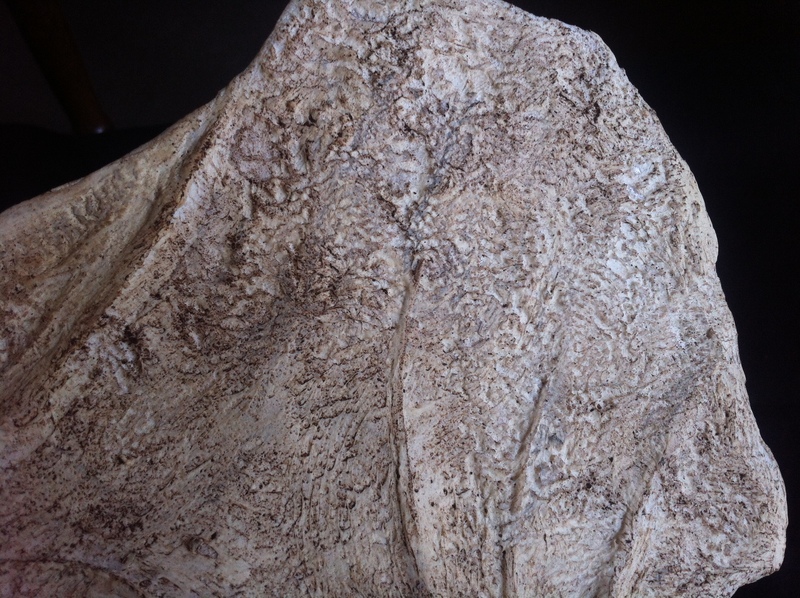 I also compensated the shape of the nasoantorbital fenestra which seems to have some details still hidden behind the rock (the lacrimal fossa, perhaps). Then I glued the two halves together. Tomorrow I will continue and add intra-cranial details such as the palate, occipital bone and cavities. 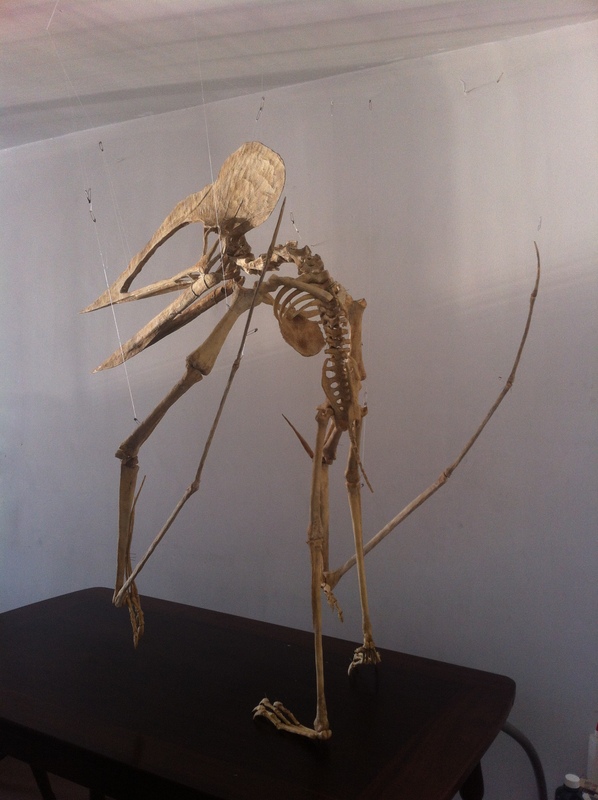 Here are some pictures of the finished skeleton. It stood complete on my table for less than a day. At night I started disassembling it. 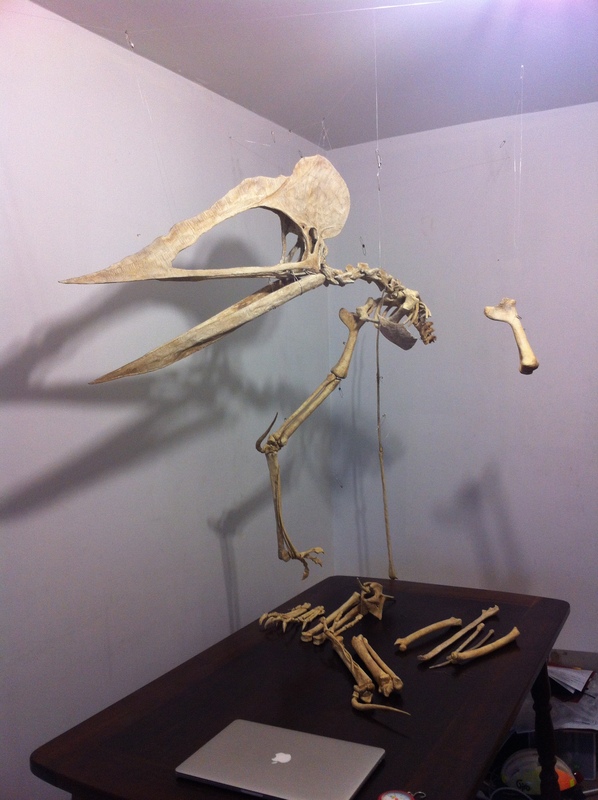 Here is the dismantled pterosaur. Everything weighs less than one kilo. I had to make a box big enough to fit the head. 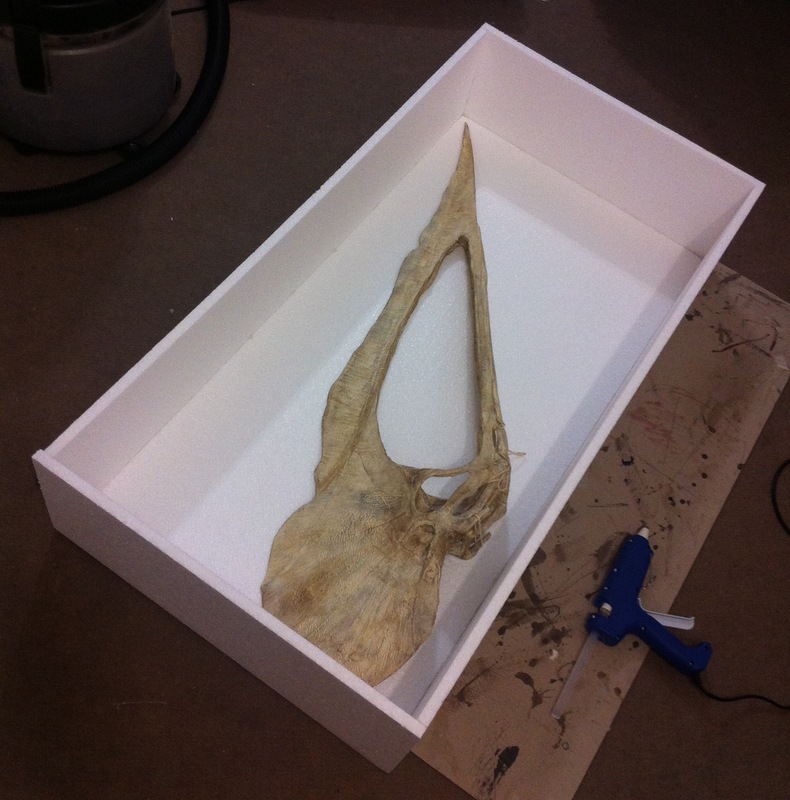 I found some space to place two other skulls and mandibles in the box. Everything weighs five kilos. We are traveling to the First Brazilian Dinosaur Symposium, in Ituitaba, MG, Brazil. 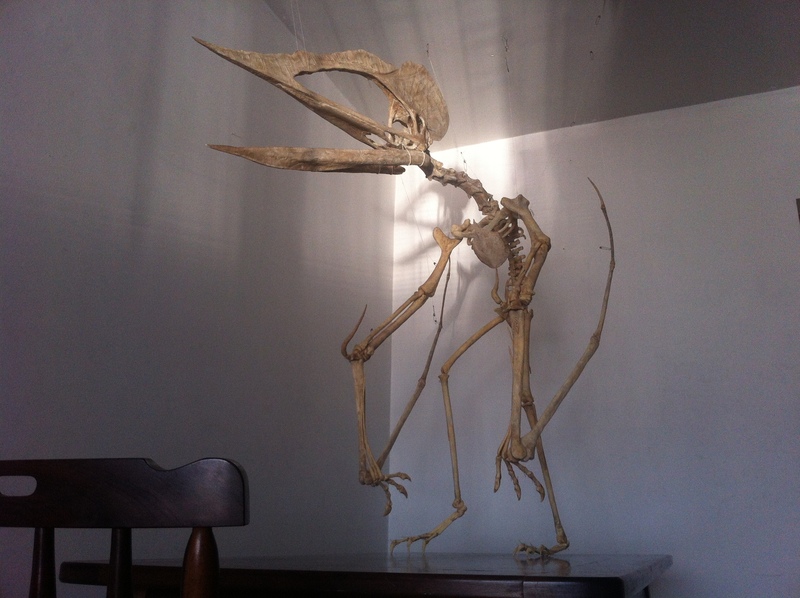 Soon I will write a final post on this pterosaur, listing my sources, references, materials used, and listing all the related posts in chronological order. 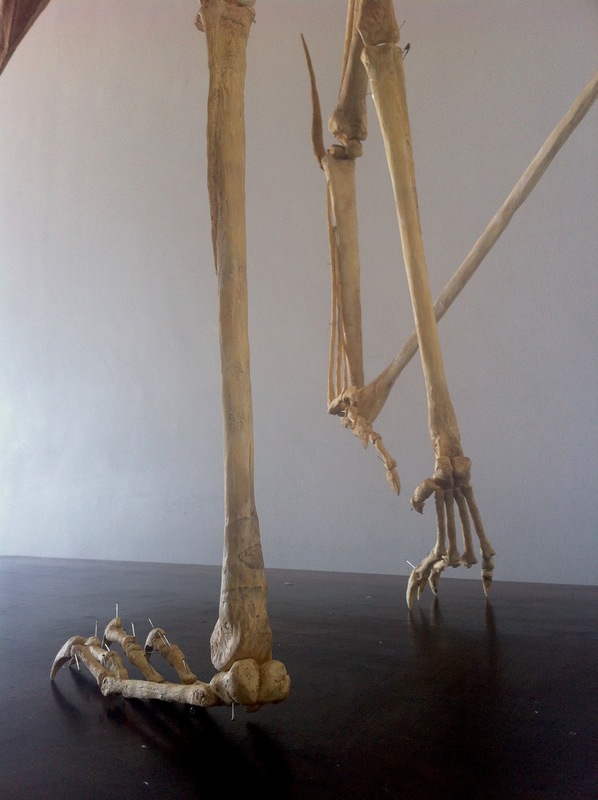 Some bones are missing, and I might add them later. 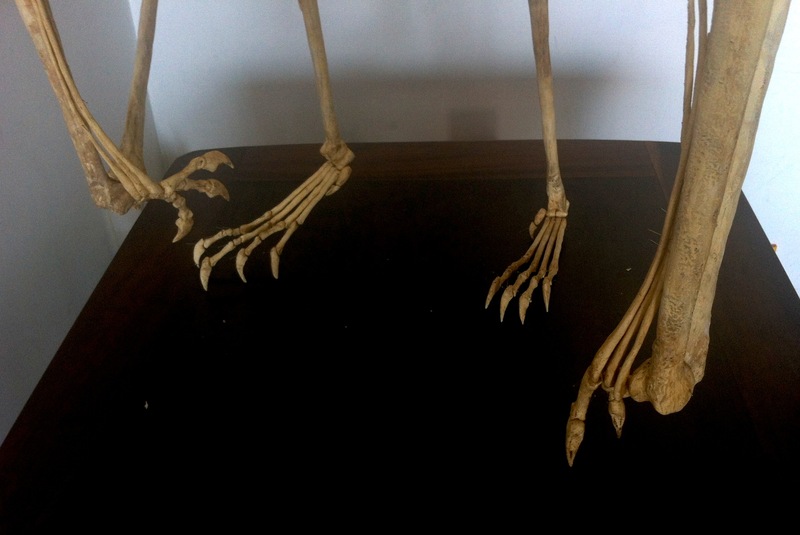 They are 1) five more sets of ribs (2 thoracical, 3 dorsal), 2) gastralia ribs and the 3) pre-pubis (which connect the pubis to the gastralia via cartilage). I made de feet based on Tapejara and material from an undescribed Thalassodromid. 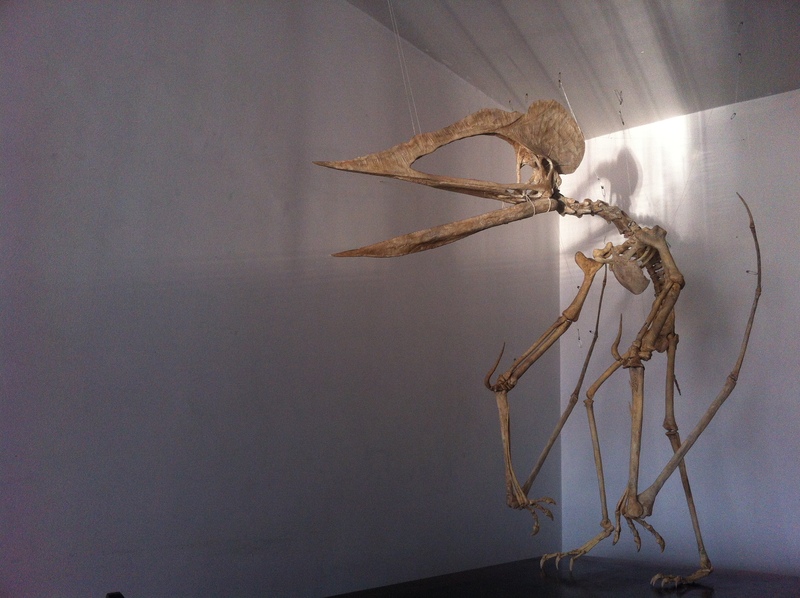 They have the same proportions as Pteranodon, except that the nails of the Thalassodromid are larger. So I used Pteranodon (drawing by Wellnhofer) as a reference and made larger nails. Here is how it will be assembled. 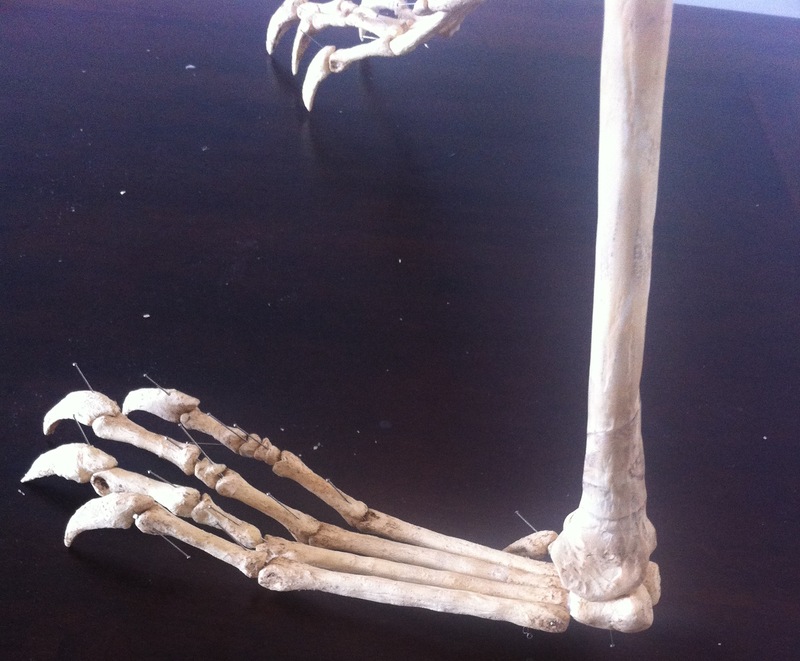 I can’t yet connect it to the tibia bone because I still didn’t make the heel bones (distal metatarsi). Oops! 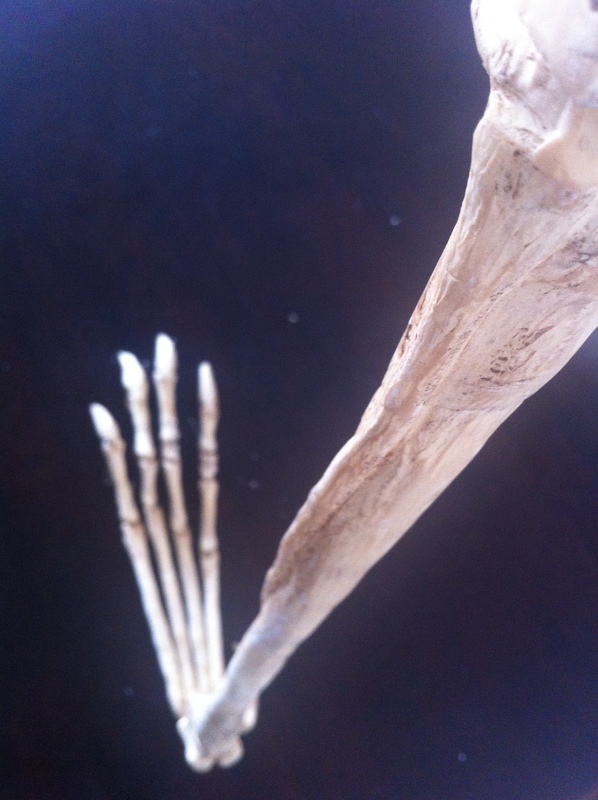 That’s the wrong end of the tibia! Here are the two feet in their natural position. I will attach the bone with silicone rubber, but for now I am just going to test so I will connect them with pins. The proximal tarsi (the ankle) are fused with the tibia (the whole bone is called tibiotarsus) so we don’t have to make them. 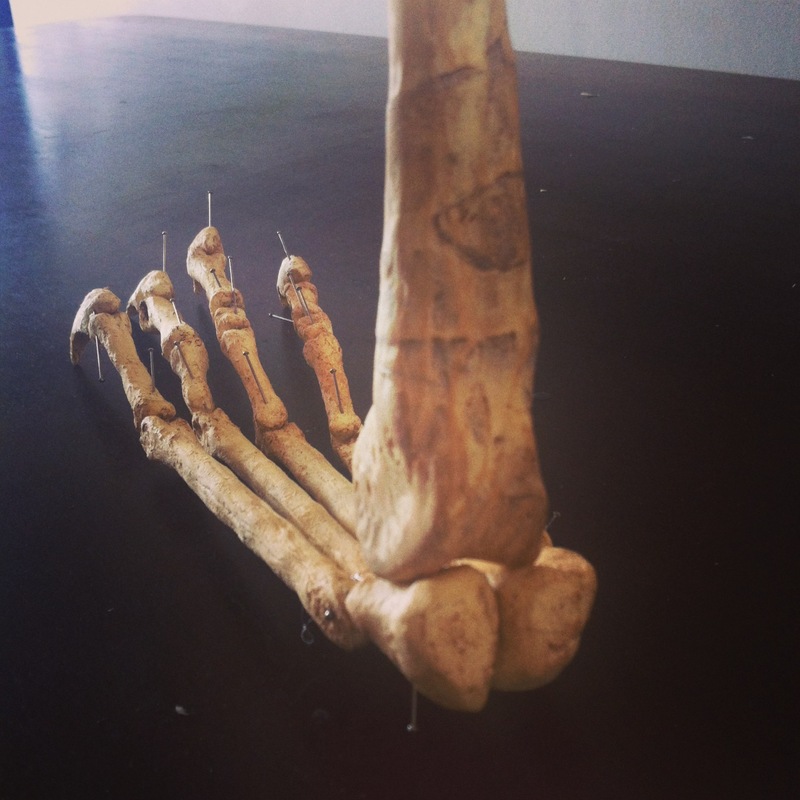 But we do need to make the distal ones (the heel). 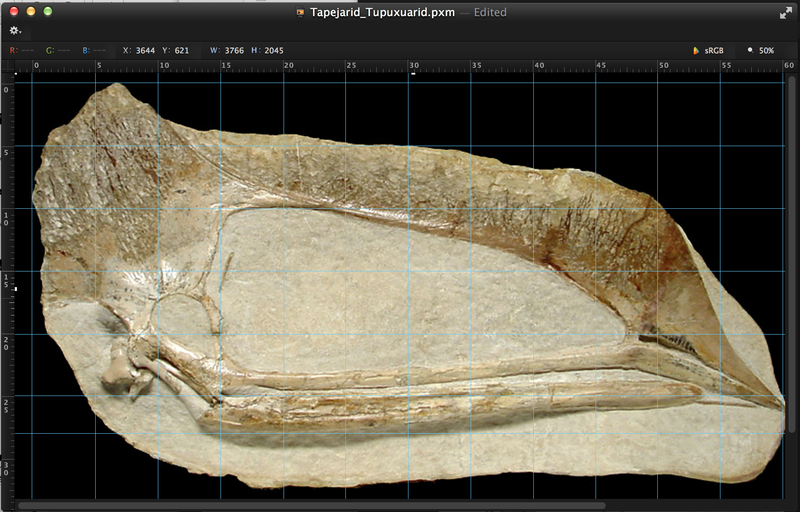 I used Tapejara carpals (scaled for Tupuxuara) from an article about ankle structure (Kellner 2004). 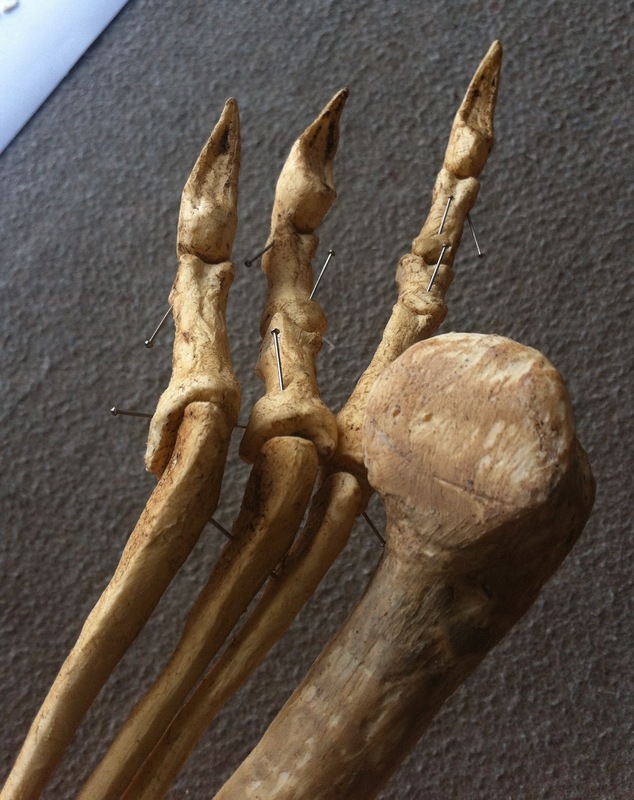 This is the side that connects to the metatarsals. And this is the side that faces down when the pterosaur stands. 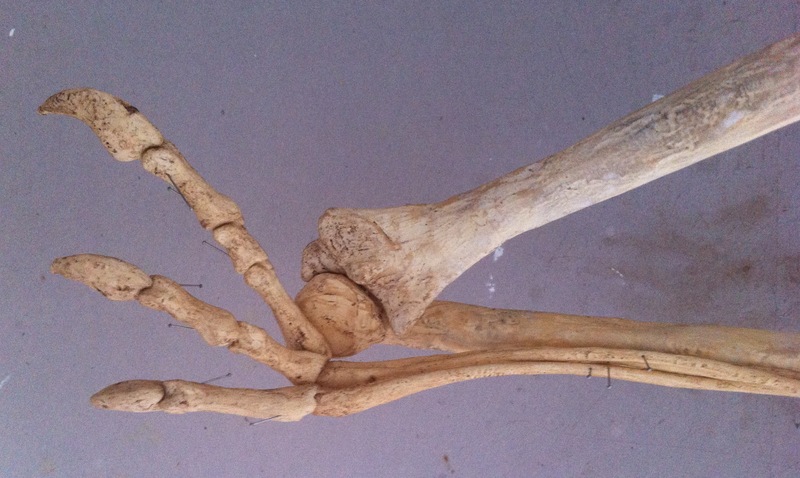 The five metatarsi connect to the two distal tarsi. 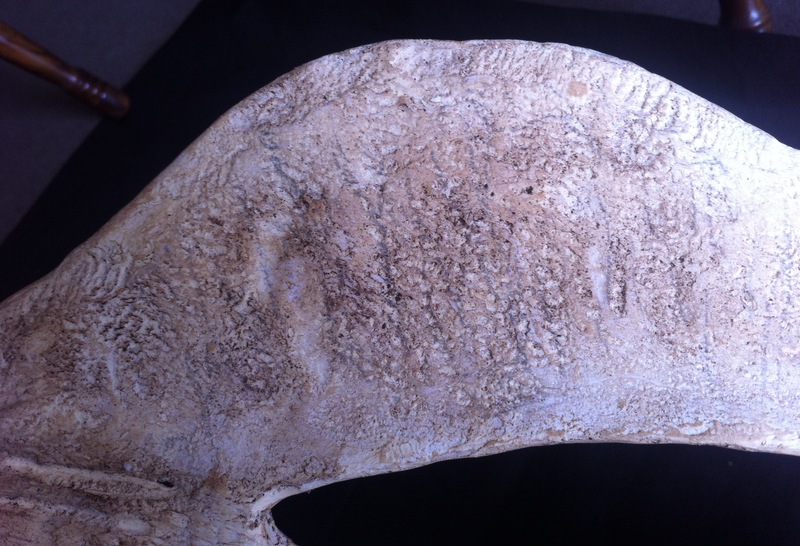 Here are some pictures of the final results (the pins are temporary: I will later connect these bones with silicone rubber). This is the right foot. This is the left foot. 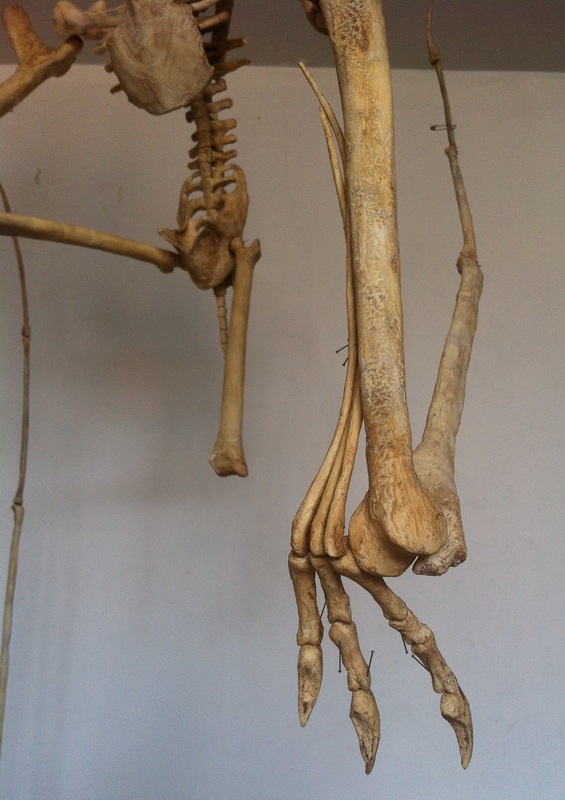 A view of the ankle and heel bones (left foot). 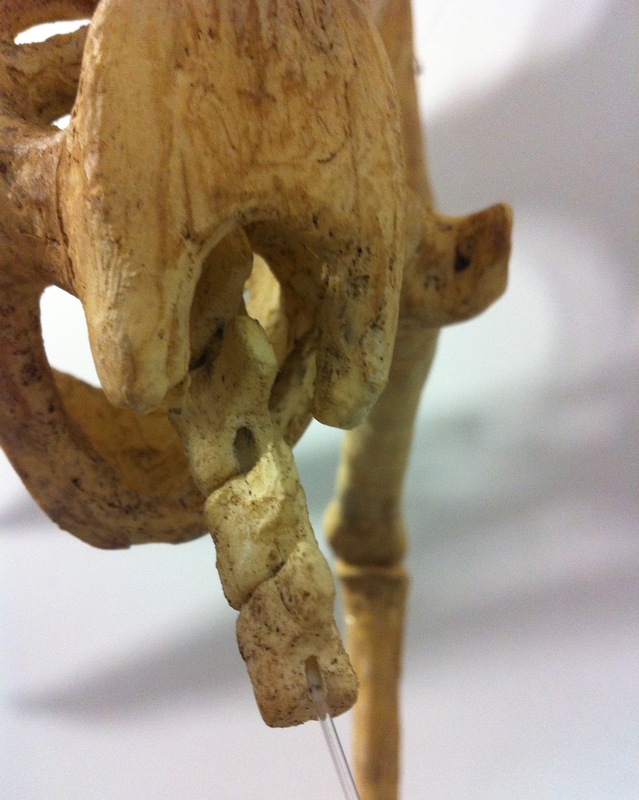 Looking down from the top of the tibia (left foot). That’s it. In my next post I will publish several pictures of the Tupuxuara assembled in this position (I will assemble it in another position next week). 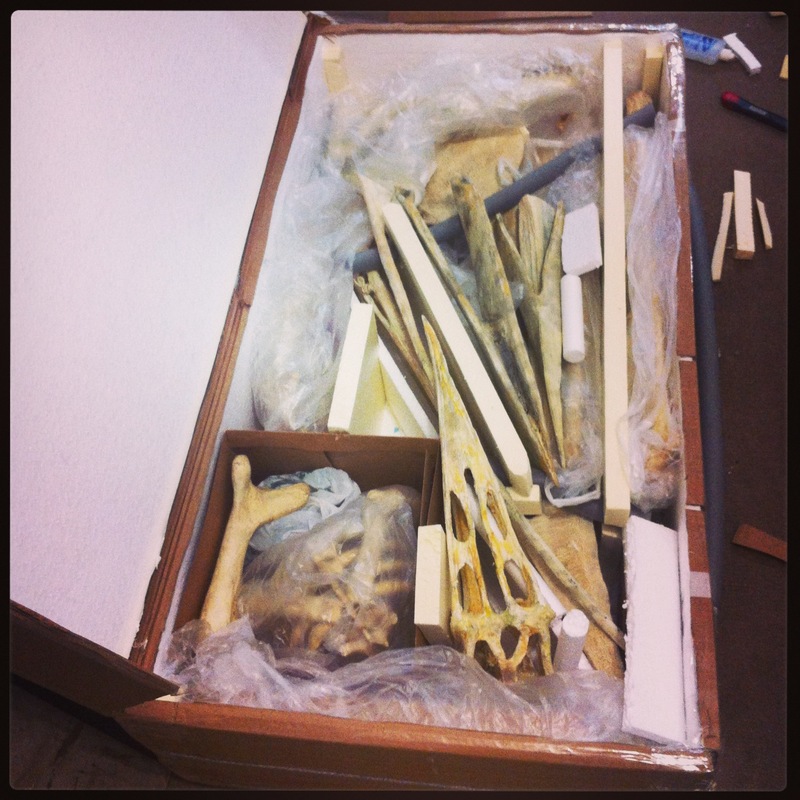 Then I will unassemble it, weigh the skeleton and pack it. 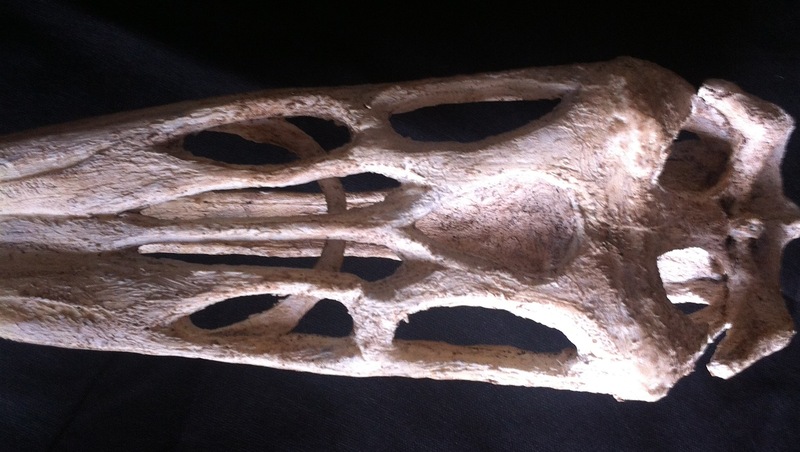 It will travel tomorrow to a paleontological conference in Minas Gerais, Brazil. 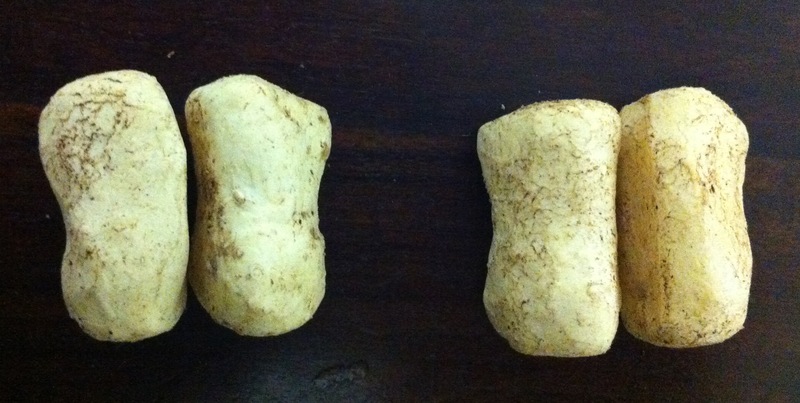 I have several photos of individual finger bones from yet undescribed species which might be Tupuxuara. 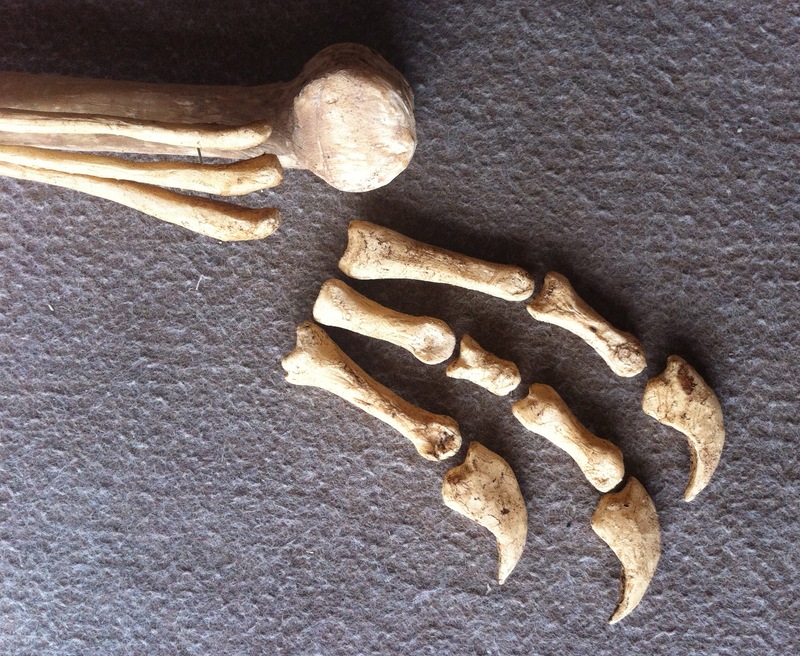 I also have pictures of the fingers of Tapejara wellnhoferi. 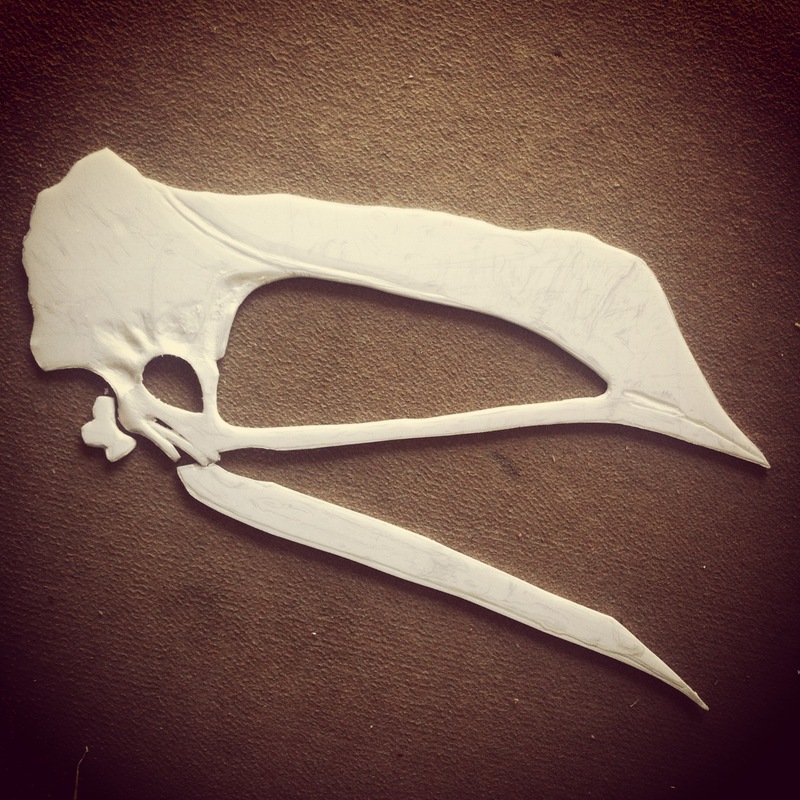 But I only have photos of the bones of Tapejara from one angle, in black and white and in low resolution, so I can’t really see if they are flattened out, or curved in some direction. I assume they are straight comparing to the other photos I have (unfortunately I can’t post any of those pictures here, since they are all unpublished research). 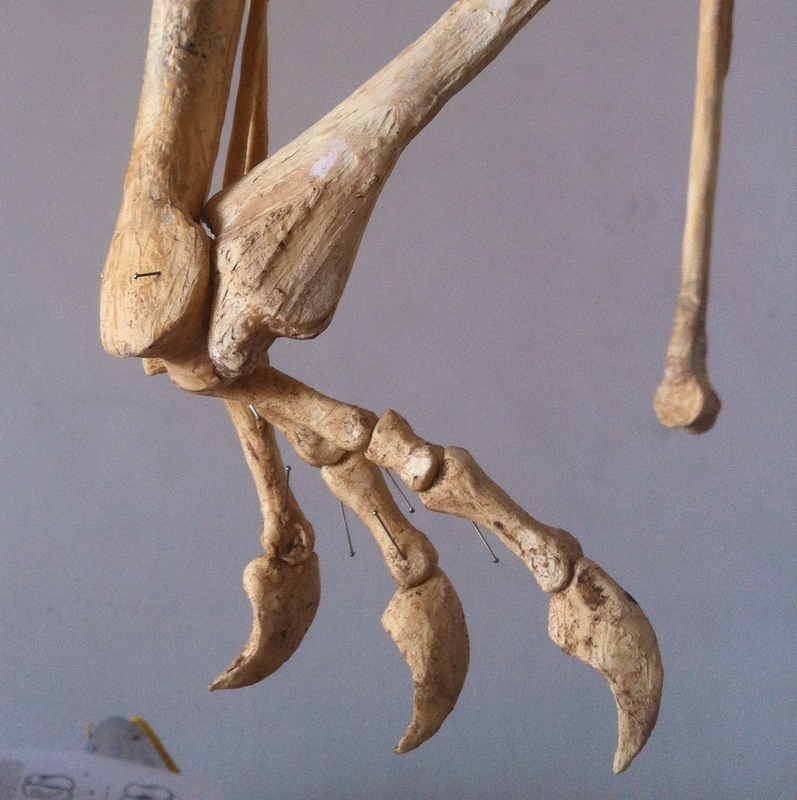 I compared different drawings of pterosaur hands and they seem quite similar. 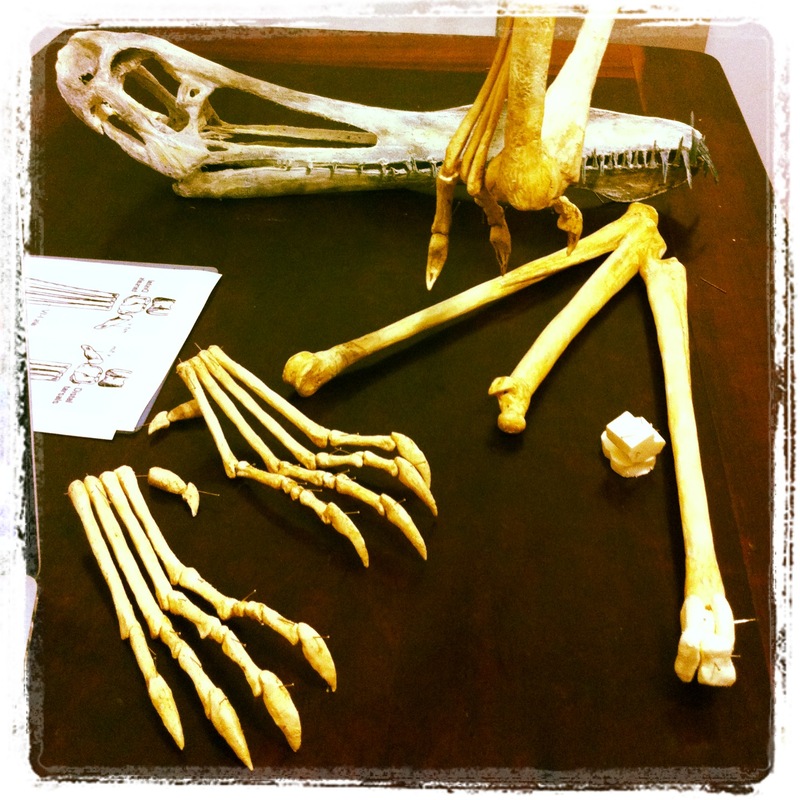 The number of phalanges is the same in all pterosaurs. Including the nails, the pattern for fingers 1-4 (where 4 is the wing) is 2-3-4-4. 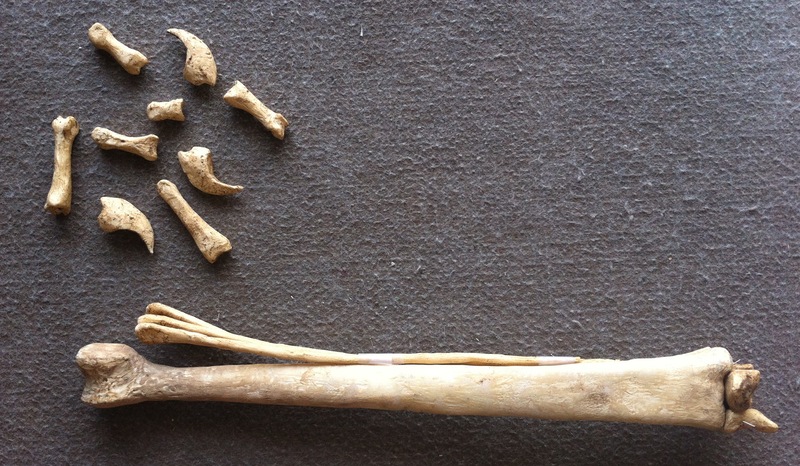 The sizes, the widths and the shape (curved, straight, flattened) of the phalanges differ across different species. As to the proportions, I found no great differences between some drawings of Tupuxuara hands (from which I have no sources), Tapejara and Pteranodon. 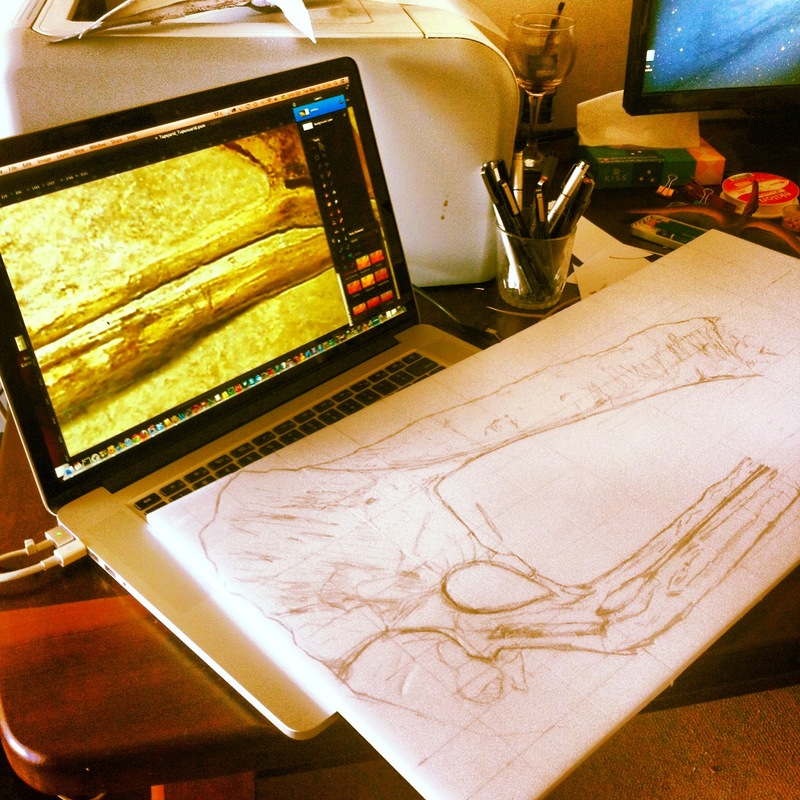 So I used this drawing by Wellnhofer, scaled it to mach the size of my Tupuxuara skeleton, and used it as a guide to carve the fingers. 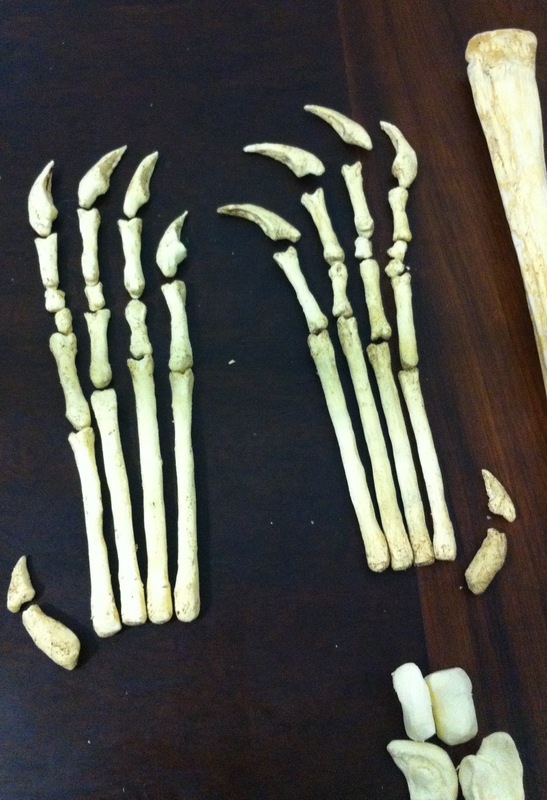 Here are the fingers and metacarpals after carving. 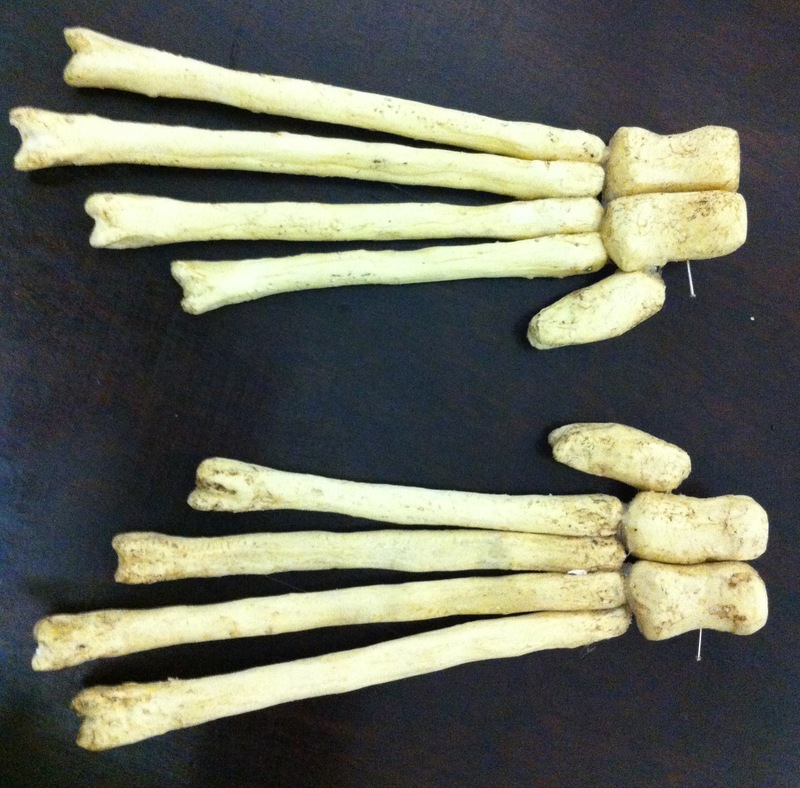 These are the finger bones and nails before assembly. 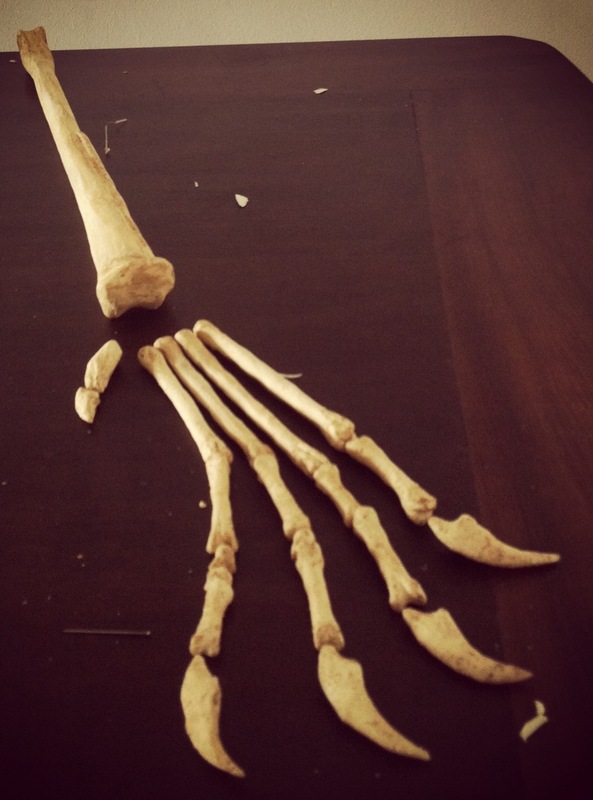 I already pinned the metacarpals together. 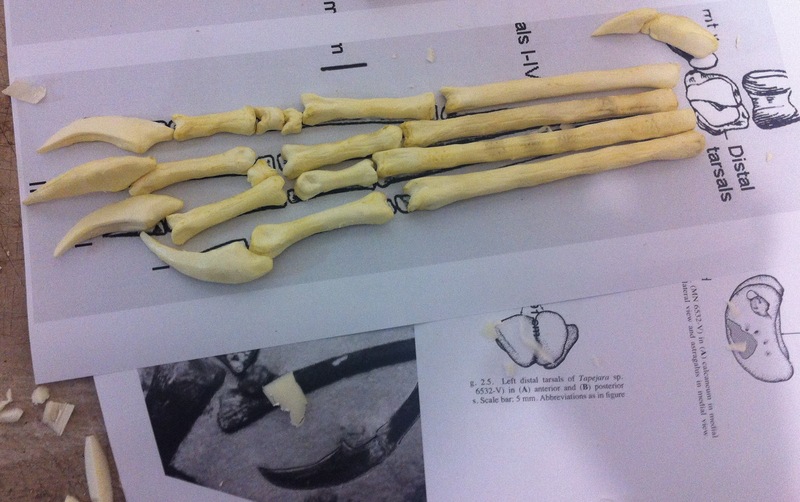 I have to turn the metacarpals a bit, but this is how the fingers will be assembled. 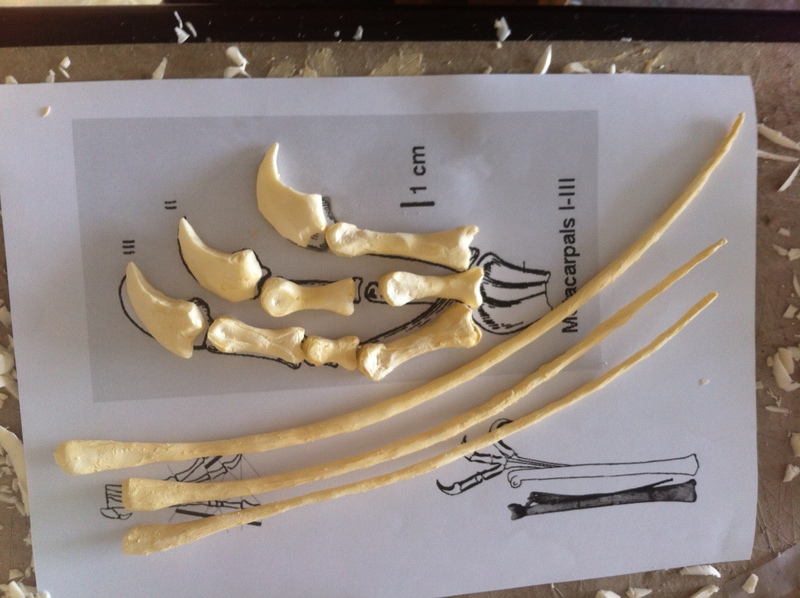 Here are Tupuxuara’s claws after assembly. I am using pins to test, but I will later keep the fingers and metacarpals together using some cartilage (silicone rubber). If I use pins all the time it will weaken the foam. 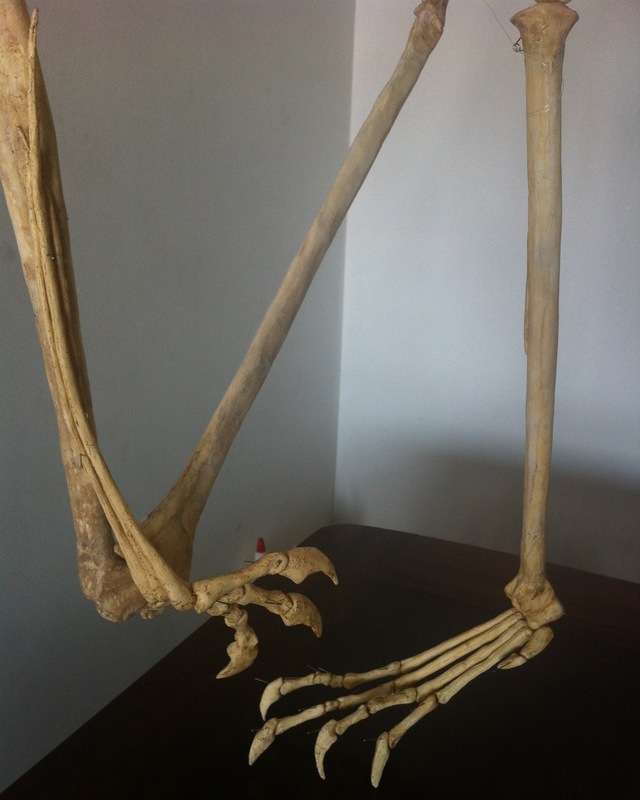 Now I placed the metacarpals back on the skeleton with the claws in place. Here are some other angles showing the left hand. This is the right hand. 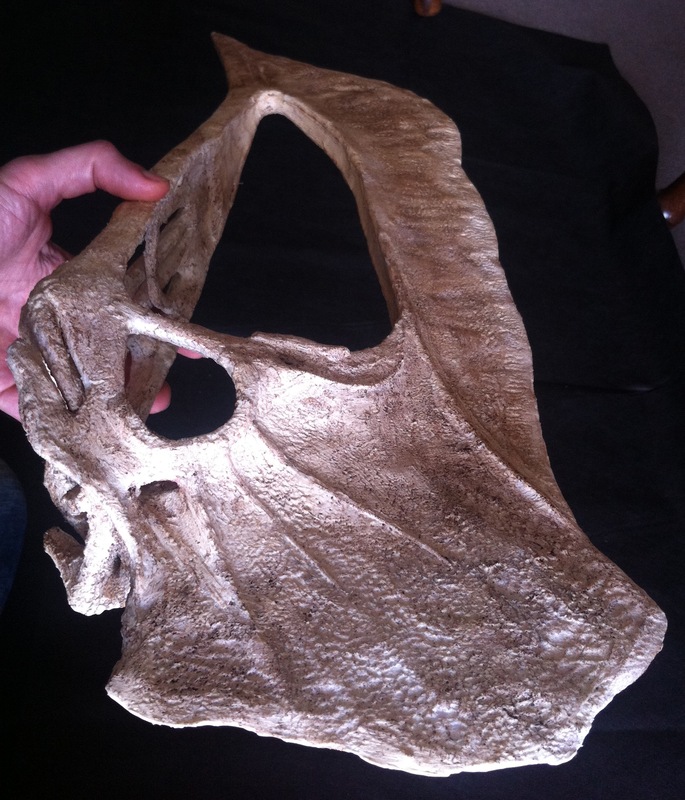 There are not many preserved pterosaur tails. I had initially planned to make Tupuxuara’s tail from Pteranodon until a friend told me to look for the tail of Anhanguera piscator. So again my source is Anhanguera (Kellner & Tomida, 2000). 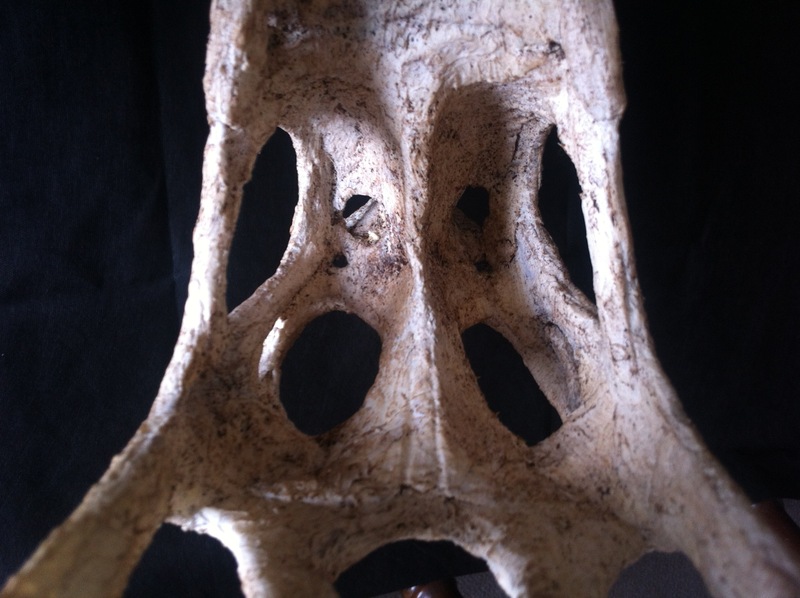 I estimated its size, printed a guide and made eleven caudal vertebrae. 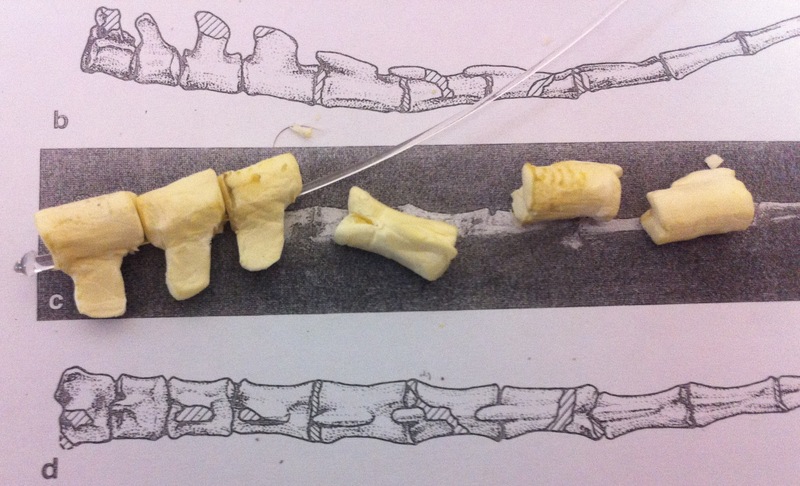 These are the finished vertebrae. To assemble the tail I used a plastic “spinal chord” (made from a plastic hanger) inserted in the tube that I used as the chord inside the pelvis. For now I just fit the vertebrae there. Later I will also attach them together with silicone rubber discs. And here is the tail in place. It probably has more than 11 vertebrae. Pteranodon’s tail has two very long vertebrae at the ent, but since this is not even Tupuxuara’s own tail, I decided to leave it as is.